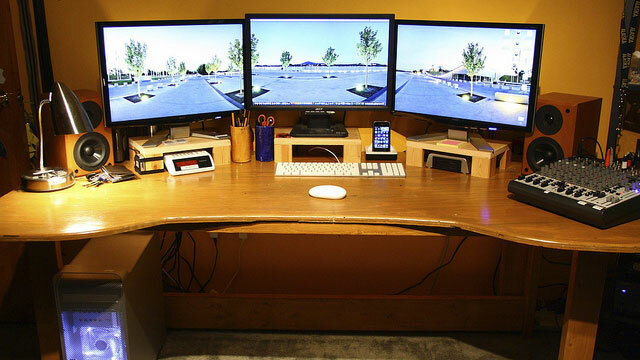 Today's featured workspace showcases three monitors aligned with the help of nifty custom-built wooden risers. A panoramic wallpaper stretching across the monitors adds to the overall pleasantness of the workspace as well. Besides the multi-monitor setup and wooden risers (made from the legs of an old desk), Chance Reecher has set up his workspace with a glowing Hackintosh, two-way Yamaha speakers and X10 Timer Controller that controls his desk lights. Check out the pic on Flickr for the full description and more photos.